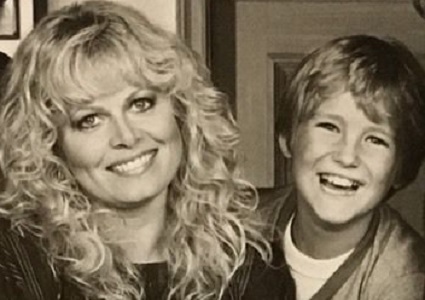 Today marks the birthday of Sally Struthers, so I thought now was as good a time as any to shine the spotlight on one of her characters. And no, it's not who you think. And not her either. And certainly not that one! 'IRONSIDE'"LOVE, PEACE, BROTHERHOOD AND MURDER"
Ironside, who has invested money in a controversial stage show, brings his team to a rehearsal when it's discovered one of its performers has died mysteriously from a drug overdose. With such a large cast there are any number of suspects. Among that cast of suspects was Sandy Fonda, a Kewpie doll cutie who also served as the "Cookie" in the mess hall for the troupe. Out of the dozen or so actors in the company, there were only four whom we really got to know. 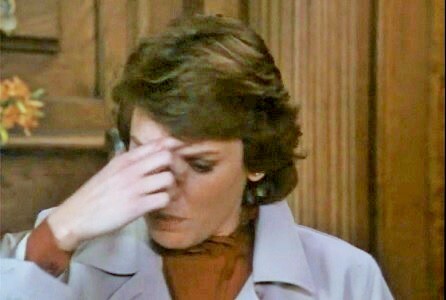 (We never even got to see the murder victim before she died - I guess I've been spoiled by 'Columbo'.) That cuts down the number of suspects even more, but even so, it's hard to picture Sandy as a viable candidate to be a murderer. There was just this air of sweetness and innocence about her that could never be turned to the dark side. We don't really learn anything of Sandy Fonda's background, which leaves her a canvas upon whom we can adorn possible links to other TV shows and characters. 1] Sandy Fonda could be related to the Fonda acting family from the real world. So it's not outside the realm of possibility that Sandy could be a cousin of Jane and Peter, with Henry being her uncle. 2] Sandy Fonda could be the half-sister of Gloria Bunker Stivic. 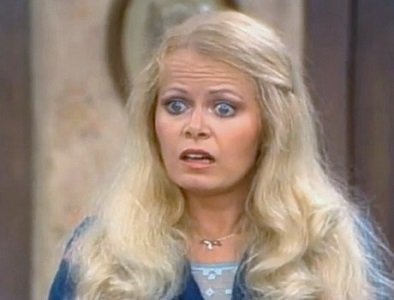 It goes beyond the fact that both Gloria and Sandy were played by Sally Struthers, our birthday girl. They look far too similar to be "identical cousins". Even Patty and Cathy Lane looked slightly different from each other and they were both played by Patty Duke. Assuming that Sandy Fonda is about the same age as Ms. Struthers, then she was born not long after the Big One - World War II. And it's possible, just possible, that her birth father was Archie Bunker. 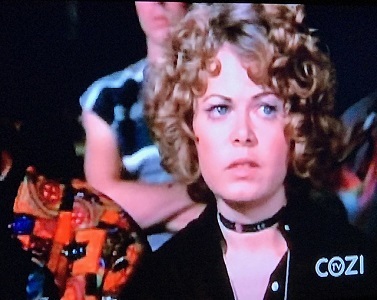 3] Sandy Fonda's acting career did not begin with the play in this episode. 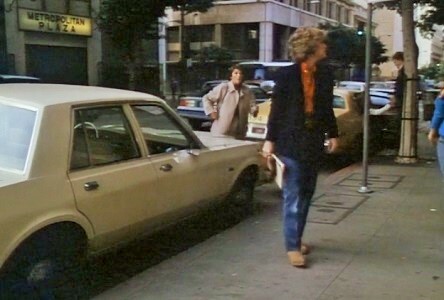 Based on that sweater which Sandy was wearing for most of the episode and which looked so new, it could be suggested that Sandy had been involved with at least the workshop production of "Godspell". 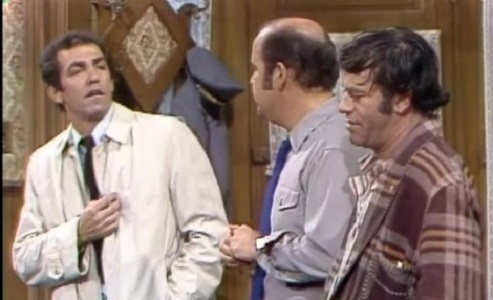 The musical opened off-off Broadway in 1971, the same year this episode was taking place. For whatever reason, Sandy Fonda did not make the transition to an actual performance of the Steven Schwartz musical. Perhaps in the Toobworld version of "Godspell", everybody in that workshop cast wore those sweaters with the Superman logo. I think later it would just be the Jesus figure in the OOB production. But my friend Maggie Bilder Cooke came up with a suggestion that would make that workshop production of 'Godspell' a musical to be found only in the Television Universe: perhaps it was truly experimental and the Jesus character was female. And the fact that they reverted back to having the role played by a man would be the reason Sandy left the show, rather than being relegated to one of the "apostles". The idea for this Super Six List came to me in March but too late for marking McGoohan's birthday. I had known about that commonality with Number Six for years but had no others at the time. It was the mention of Sgt. 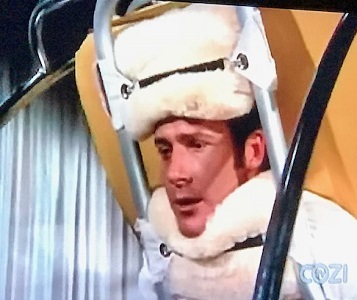 Brown's birthday in an episode of 'Ironside' and then checking Don Galloway's birth date which made me realize that McGoohan and Number Six might not have been so unique. Still, I did nothing about it at the time. 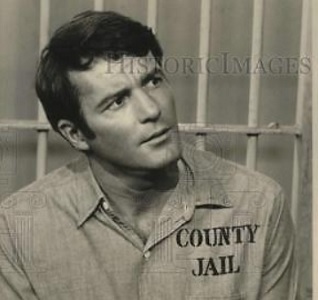 So when I learned of a third one on April 7, in which Bret Maverick and James Garner shared the same birth day (O'Bviously not the same year), and it was too late to do it up properly, then I knew it was time to do the research. And because it was Galloway and Brown who put the idea in my head, I decided to save it for today. Why today? For one thing, Ed Brown and Don Galloway share today as their birthday. 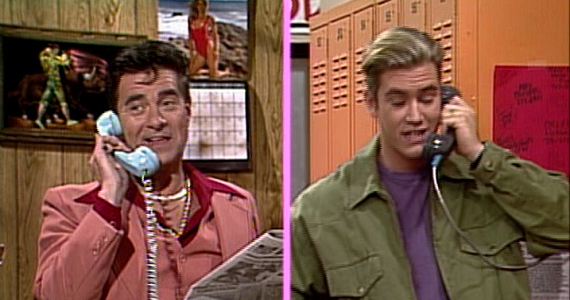 WELCOME TO THE TV CROSSOVER HALL OF FAME! Sgt. Brown is being inducted into the TV Crossover Hall of Fame on his birthday which also happens to fit right in with our new Friday feature! 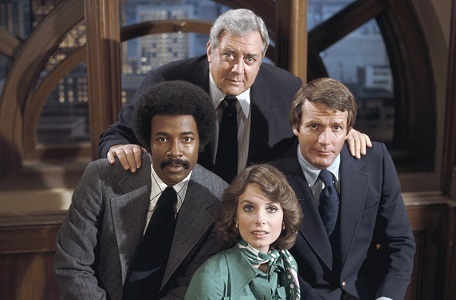 'Ironside' is an American television crime drama that aired on NBC over 8 seasons from 1967 to 1975. 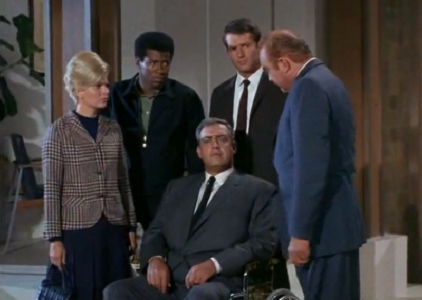 The show starred Raymond Burr as Robert T. Ironside, a consultant for the San Francisco police (usually addressed by the title Chief Ironside), who was paralyzed from the waist down after being shot while on vacation. Ed Brown figured in crossovers with two other TV series. In 1971, 'Ironside' served as the launch pad for a two-hour pilot for 'Sarge'. A police chief who is confined to a wheelchair and a former cop who is now a priest team up to discover who has been committing a series of murders of local priests. 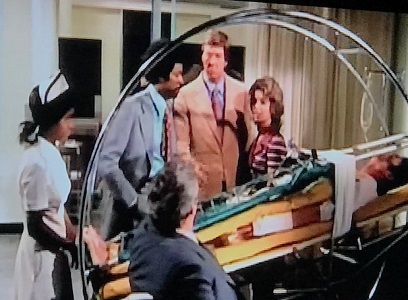 NBC's 1971 fall TV season opened with a two-hour crossover between 'Ironside' and a new series, 'Sarge' starring George Kennedy as a cop-turned-priest. Kennedy's San Diego–based Father Samuel Cavanaugh comes to San Francisco because of the death of a friend and fellow priest and his investigation gets him embroiled with Ironside and his staff. 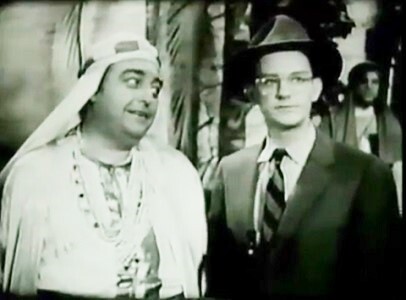 The special consolidated the two shows' consecutive time slots and has been subsequently seen as a TV movie, "The Priest Killer". - "Five Days in the Death of Sgt. Brown: Part II"
Sgt. Ed Brown decides to go through with the surgical procedure that will hopefully restore mobility to his legs. The procedure involves the a process where his nerves will be reconnected in a procedure invented by Dr. Ritter as well as an infusion of polypeptides administered by Dr. Paul Hunter. However, a complication arises when the daughter of Dr. Ritter, the man who will be performing the surgery, is kidnapped by someone who was hired by the person who wants to see Ed dead. 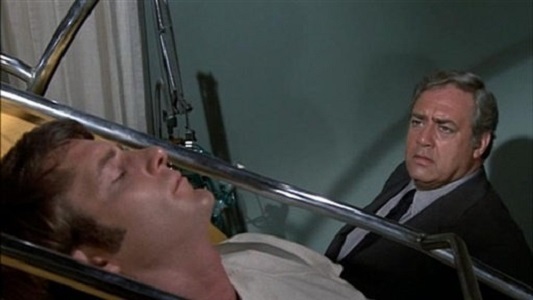 Also, Chief Ironside has flashbacks to the events surrounding his own paralysis and confinement to a wheelchair. 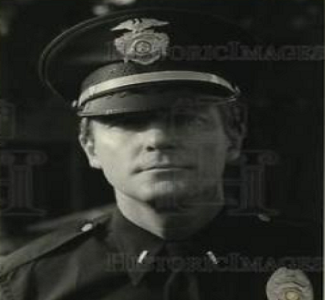 Chief Ironside has just retired and is looking forward to running his vineyard with his wife. But his retirement is interrupted when his old friend and colleague Ed Brown, who is now working for the Denver police department comes to him and asks him to fill in the vacancy left by the untimely death of the Chief. Ironside does so but with condition that it will only be temporary. But things are further complicated when Suzanne Dwyer, the daughter of his old friend and colleague, Eve Whitfield, is the prime suspect in the murder of her boyfriend, Mike Quinn, whom she suspected was seeing someone else. 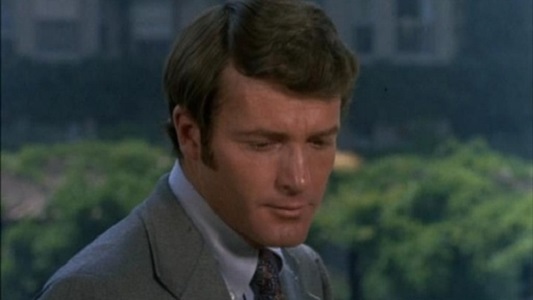 Though Ironside refuses to believe that Suzanne is guilty; the evidence is all against her. So, Ironside's other old friends, Mark Sanger and Fran Belding come to Denver to help. It also seems that this whole matter could be connected with the previous Chief's death (murder? ), and also seems that someone in the department is responsible. 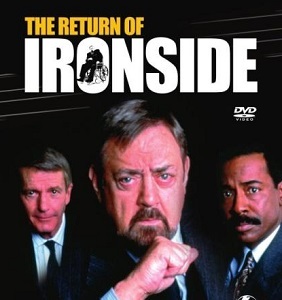 Burr and the main cast reunited for a made-for-TV movie in 1993, "The Return of Ironside", which aired on May 4, 1993 on NBC, not long before Burr's death. At the time, Burr was starring in a series of telefilms for NBC playing his most famous character, Perry Mason. 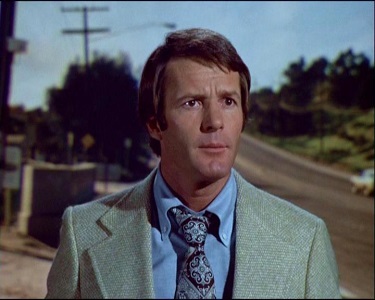 In the intervening years between the end of Ironside in 1975 and the first Perry Mason movie in 1985, Burr's appearance had undergone some changes. His hair was grayer, he had gained a significant amount of weight, and after years of playing clean shaven characters he grew a beard. Unlike the original series, which took place in San Francisco, California, the reunion was set and filmed in Denver, Colorado, with the justification that the character Ed Brown had become the city's deputy chief of police. (Denver was also where most of Burr's Perry Mason TV movies were produced.) 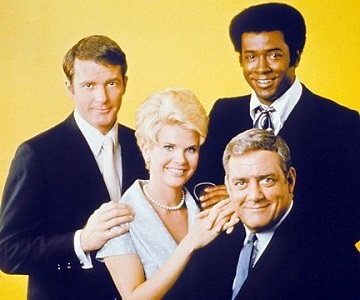 Galloway, Mitchell, Anderson, and Baur re-created their roles for the movie even though Anderson and Baur had not worked together at the same time on the original series. Those are quite impressive when it comes to an official tally, covering all the bases - series, pilot, guest appearance, and reunion movie. Just need a distinctive commercial appearance! But there could be theoretical connections which could be made via Ed Brown. For instance, how about that he was named after his father's brother? That Ed Brown was a cantankerous old crank of a coot who owned a car garage in Los Angeles' inner city. This is more than just a trivial honorific or theoretical crossover; it just happens to be falling on a Friday because of Don Galloway's birthday. But this should be awarded full honors with our other major July induction for private eye Jeff Spencer. Mr. Galloway is sadly no longer with us, but it's not unreasonable to believe that Ed Brown, the retired Chief of the Denver Police, is still alive in Toobworld. I tip my hat to both of them. 'Columbo' is one of the shows which I always wanted to "de-Zonk", to splain away all of those references to the show in other shows even though they should all be sharing the same TV dimension. Detectives Chris Cagney and Mary Beth Lacey needed to interrogate a murder suspect. Personally I don't think it's gonna work. Why not? It always worked for Columbo. He's kept us waiting thirteen minutes. Columbo would never have stood for this. Oh, sir, we are so sorry to take up your time like this, sir. Well, we just came by, Mr. White, to tell you the DA dropped the charges against our suspect. Oh, no, Mr. White. We just had the wrong guy. It seems that the man we had had been set up. Yes sir, but we weren't turned off from it, were we? I mean, sometimes, you get a hold of a piece of evidence (looking through the file) and then you look at all the wrong things. Do you happen to have one of those videotape recorder things, sir? Well, the prices on them are really going down. Anyway, this fella that we work with, he got one for Christmas. You see, because when he was working nights, he got hooked on this soap opera, er, "Beyond the Horizon". And now that he's working days he can record it and then he can look at it on weekends. Detective Lacey, please, I'm rather busy! I cannot look at those photographs again. Please! Oh, I'm sorry, sir, I really am, sir. I wished you'd look. It's very interesting. See sir, look at the TV set here, sir. What does this have to do with it? Get to the point! Just look at the woman who's on the TV set. Please, because I would never have known myself but this fella we work with, he tells me that this woman, Liz, did not come back from vacation until Wednesday. I'm afraid I don't really understand what you ladies are talking about. You're right to be confused, Mr. White. You see that the envelope you gave us was post-marked five days before your wife's death. So, the pictures couldn't have been in it because the pictures were taken five days later, Wednesday, the day of your wife's murder. So what you did was mail this envelope to yourself and then you dropped the pictures in later. On Wednesday the nineteenth, you waited on the fire escape at the Manchester Hotel and you took those pictures, and after her boyfriend left, you let yourself in the room and murdered your wife, didn't you, Mr. White? What we're saying, Mr. White, is that you have the right to remain silent. If you choose to give up the right to remain silent, anything you say can and will be held against you in a court of law. You have the right to speak to an attorney and have the attorney present during the questioning. As I read Mary Beth's exchange of dialogue with Mr. White, I could feel how she was channeling Peter Falk's performance through her interrogation. "Please, because I would never have known myself but this fella we work with, he tells me that this woman, Liz, did not come back from vacation until Wednesday." 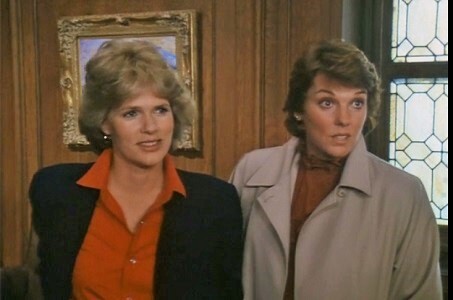 It's "a fella we work with" for Mary Beth; it's "my brother-in-law George" for Columbo. 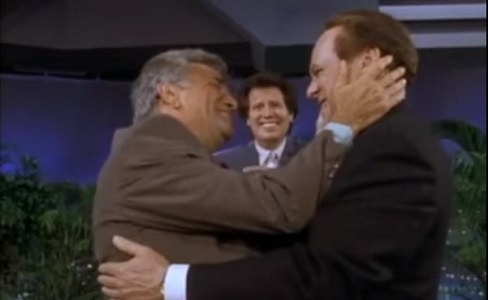 We know Falk has a televersion in Earth Prime-Time; we saw him in an episode of 'The Larry Sanders Show'. And we know that televersion played Lt. Columbo in the Toobworld version of 'Columbo', which may have significant differences from the one we know here in the Real World. How do we know he played the role? Because Laura Holt used the 'Columbo' episode "Playback" as her solution to a case. "Columbo... Peter Falk... Universal Studios... 1975! 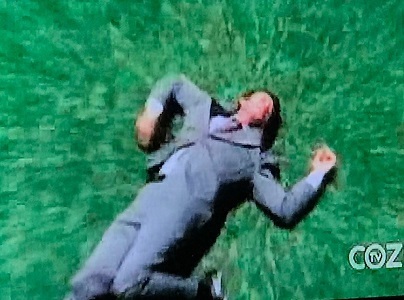 In an episode entitled 'Playback', Oscar Werner kills his mother-in-law. He seems to have the perfect alibi until Columbo discovers he used a video tape to alter the apparent time of the murder. Now all we need to do is find that tape. If Columbo can do it so can we!" Another example that Columbo had his life dramatized for television was when a New York police detective came to see a bus company employee for his help in a drug case. Stanley Belmont managed the company's lost and found department and he and his brother-in-law thought Lt. Milford looked like Lt. Columbo. Take a look at Milford - the only thing that ruins the illusion is that his raincoat looks so much cleaner. But not all the references had to come from the Toobworld version of the TV show. It's my belief that Frank Columbo finally did get around to writing a book about the cases he investigated. These would be the cases we saw on the television here in the Trueniverse. 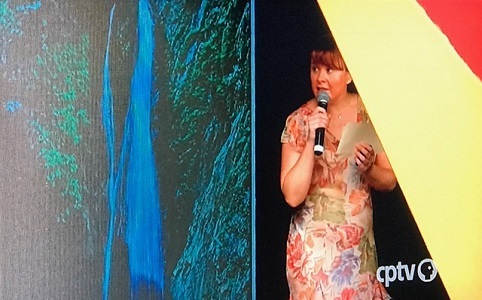 Those in the televersion of 'Columbo' could mostly be fictional with dramatizations of actual cases mixed in - as we saw with Laura Holt's reference to "Playback". There were times though where I think it's the book which brought the Lieutenant to a TV character's attention. And with most of my examples of this, 'Columbo' isn't even mentioned! 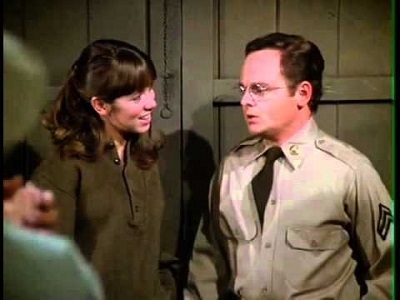 But definitely, Mary Beth Lacey was basing her interrogation on they way Peter Falk did it as Columbo on TV. So any show that Zonks 'Columbo' is either referring to the TV show based on the Lieutenant's life or the book written by Frank Columbo. 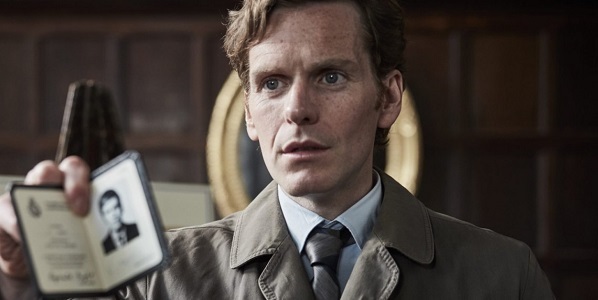 OUR WEEKLY "ENDEAVOUR" - "QUARTET"
Karl Fucher is shot dead during a televised games tournament and Max believes he is an East and not West German. Special Branch relieve the local police, removing the body, before two mysterious men approach Morse and point him towards perfumier Sebastian Fenix, who employed the dead man as a translator. Despite warnings Morse investigates alone, discovering a safe spy house in Oxford and a link between Fenix and the sale of secrets to the Russians, also involving a respected academic. Thursday meanwhile deals with a turf war and a domestic abuse case which ties in with Morse's sleuthing. with a distinctive facial scar we're trying to find. It's not the Scarlet Pimpernel! 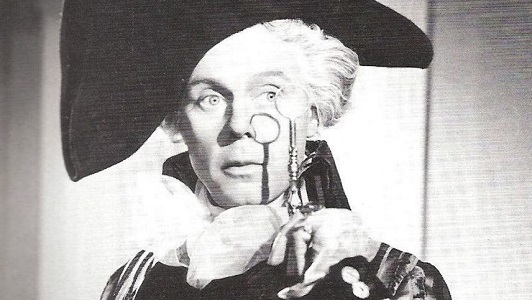 As there was no indication that the Scarlet Pimpernel was mentioned in connection to movies, TV mini-series, or the play and novel written by Baroness Orczy, then our standard practice here at Toobworld Central is to accept that such name-dropping is about an actual person. 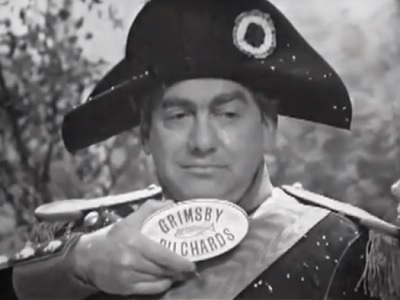 And the official version of the decepticely fey Sir Percy Blakeney in Earth Prime-Time was portrayed by Marius Goring in a TV series which ran from 1955 to the following year. Leave the "do or die" to Special Branch. This reference is a bit trickier. Thursday, even if he knew who secret agent John Drake was, he wouldn't be bandying that nickname about like that where they might be overheard. 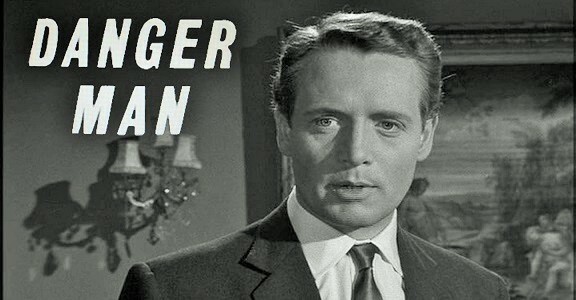 I think he was referring to the TV series 'Danger Man', which starred Patrick McGoohan as Drake. But I think he was real in the TV Universe and that the show was depicting fictional adventures from his career as a spy. This was the work of the shadow organization known as UNReel, which would fictionalize the lives of people who should have been kept secret from the prying eyes of the public - spies, superheroes, Gallifreyan Time Lords, and the like. 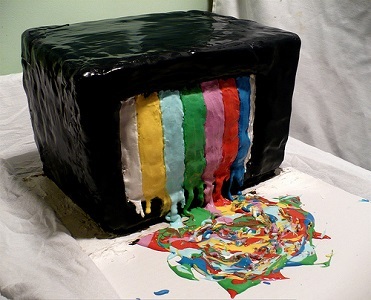 These media portrayals - books, films, TV shows, comic books, etc. - provide them with plausible deniability should their secret adventures get noticed by the masses. So there was a TV show about John Drake, two in fact - 'Danger Man' and 'Secret Agent'. From the minimal research which I usually do on pop culture Zonks like this, I don't see any TV show which mentions John Drake by name. So the 'Danger Man' of Toobworld could be so fictionalized, Drake was never mentioned as a character, that he had a roman a clef televersion. It looks like only the name of the show was cited by characters in other TV shows, just like this example. But thanks to the 'Rock & Chips' episode "Five Gold Rings", we at least know Patrick McGoohan was hired to play the role because of his resemblance to John Drake. The TV show which was covering that international contest of carnival jousting, 'Jeus Sans Frontieres', was meant as an echo of a real show 'It's A Knockout'. And that in turn was based on the French series "Interville". All three shows co-exist in Toobworld. A Russian hit man almost killed Morse in a (hardly) safe house on Sebastapol Terrace. In the TV show 'Sykes', Eric and his twin sister Hattie also lived in a house on Sebastapol Terrace. But that was in East Acton in the London area. So this is just a trivial note in which the streets have common if distinctive names but which don't serve as links. 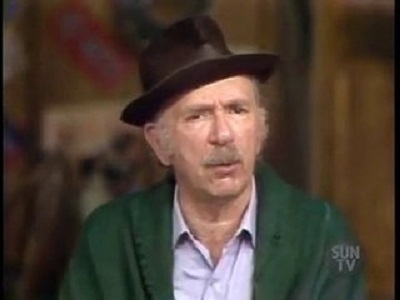 Similarly, one of the characters, the news agent named Dozier, called his wife a "silly old moo". This was a phrase used by Alf Garnett of 'Til Death Us Do Part' in describing his wife. (His American counterpart, Archie Bunker, called Edith "dingbat".) It's just a phrase which probably had widespread use among the abusive husbands of the time. So I'm dismissing its relevance for crossover potential. 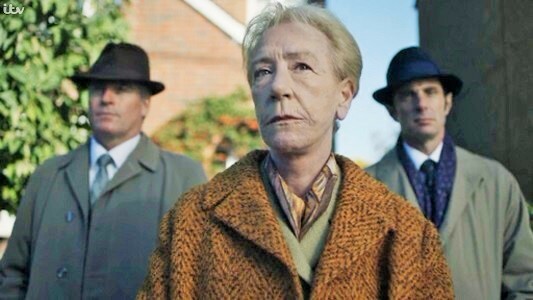 I'm going to need to do more research into Ellie Haddington playing Hilda Pierce in the last few seasons of 'Foyle's War'. I loved that character and now it looks like I never did get to finish that series because there were seismic events in Hilda's life in that last episode. This would affect my hopes to conflate her with Millie Bagshot. So there will be a sequel to this post. It would only be wish-craft on my part to claim that Dorothea visited the 4077th, but I'd like to think she did so. If so, I think she would have developed a friendship, perhaps even more, with Corporal Walter O'Reilly. Okay, this is Lt. Linda Nugent. 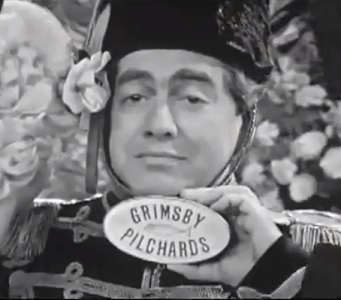 On the wall outside the Doziers' shop is an advertisement for "Grimsby Pilchards", a non-existent product for which Tony Hancock made a series of disastrous commercials in the famous 'Hancock: The Bowmans' (1961) episode of his final BBC series in 1961. This is a legitimate, if trivial, connection between both series. 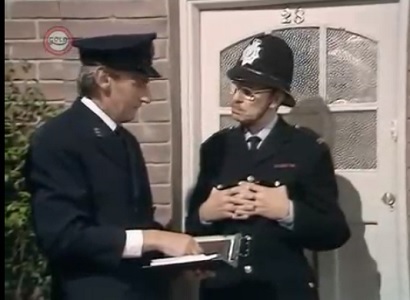 It is possible that the two mysterious characters whom Morse encounters during his inquiries, "Singleton" and "Louis", are inspired by the characters played by Richard Vernon and Michael Aldridge (and later by Vernon and Denholm Elliott) in the 1960s series, "The Man In Room 17", although the gimmick of that show was that the two characters were never seen outside the eponymous room. I've also seen comparisons to Charters and Caldicott of "The Lady Vanishes" for Louis and Singleton, but I have to reject them both as being of any use for Toobworld. All six characters exist in Toobworld and no believable reason exists as to why they were using aliases if they were conflated. And they don't resemble each other enough to ignore the recastaway discrepancies. We do have one last O'Bservation - one of "The Numbers" from the Valenzetti sequence in 'Lost' showed up in the episode. 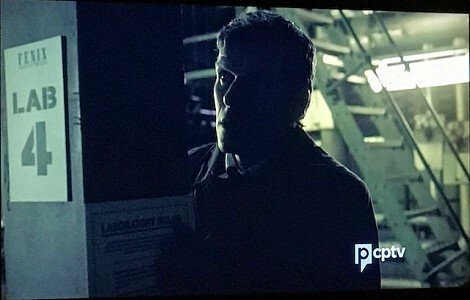 The numeral "4" was on a pillar in the Phenix labs. So, there are a couple of connections to be found in this episode. Not many on its own, but the series overall is quite the hub for crossovers. See you next week for the season finale! Monica Owusu-Breen has been hired by producers 20th Century Fox Television to pen the script for the new take on Joss Whedon's cult favorite "Buffy the Vampire Slayer". A network is not yet attached. 20th Century Fox Television, who produced the original Joss Whedon drama, have put a new take on the beloved Sarah Michelle Gellar drama in development. Writer Monica Owusu-Breen, who worked with Whedon on ABC's "Agents of SHIELD", has been hired to pen the adaptation. Whedon will be an exec producer on the series and has been working with Breen on the script, which features a black actress stepping into the role of Buffy made famous by Gellar. Here's my O'Bservation: I'm all for a continuation of the story on television. I support a more inclusive cast, and there's no reason why the lead character shouldn't be a black slayer. They had a black slayer in the old series; her name is Kendra. So it's already established and won't bring about the end of the world. But the slayer in the new show shouldn't be Buffy. They should be working on a continuation, not a reboot. The problem with reboots is two-fold - if the original was good enough to merit interest in bringing it back, a remake with new actors is going to clash with the viewers' memories and the original fans will probably stay away. Another reason they would probably stay away would be that a remake would have to start over again from the beginning. And why would fans of the original want to come back for that? CBS' has 'Hawaii Five-0' and 'MacGyver' chugging along, but I don't think it's because they're that successful at being so pupular. They just happen to hold a reasonable audience on Friday nights, one of two network elephant graveyards. But I don't think their upcoming reboot of 'Magnum PI' will be accepted. That was a property which had Selleck's imprint imbedded too deeply to cast aside for a newer model. In this case, I think the new lead character should be a new slayer, in a new location, with perhaps a female Watcher. This would leave the door open for Sarah Michelle Gellar or any of the other surviving cast members to make return guest appearances. If they're worried about the audience shying away because of the original show's massive backstory, Russell T. Davies was faced with the same thing when he brought back 'Doctor Who'. His decision was to jettison a lot of it by getting rid of Gallifrey and the other Time Lords. I think the producers could find their own twist to make it easy for new viewers to join in. Everything about being a slayer will have to be hashed over again anyway, so why does it have to be Buffy? Oh well. When it finally gets on the air, I suppose it will have to be relegated to an alternate TV dimension. Perhaps into Black Toobworld but definitely into Toobworld2, the Land O' Remakes. 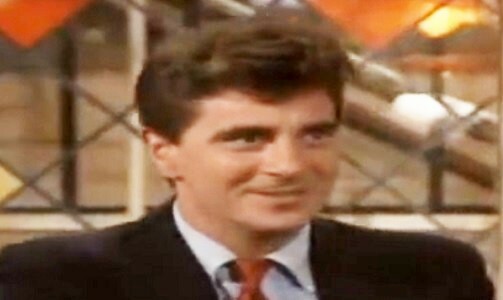 MONDAY MEMORIAL TVXOHOF - GEM DIAMOND, "GGTK"
Gary Beach, a Broadway and TV veteran whose portrayal of a truly terrible theater director in Mel Brooks' monster hit "The Producers" won him a Tony Award in 2001, has died, said his agent, Steven Unger. He was 70. Unger said Beach died Tuesday at his home in Palm Springs. No cause was given. After nearly 20 years in New York, Beach moved to Los Angeles. "I fell in love with the idea of having a car like an adult," he said. 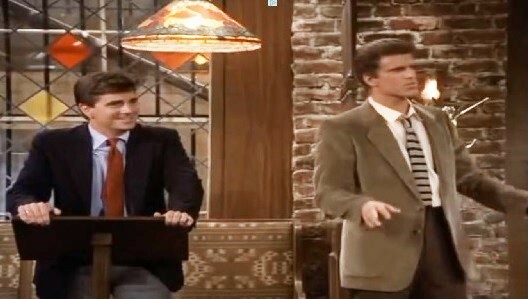 There, he acted in such shows as "The John Larroquette Show," ''Murder, She Wrote," ''Saved by the Bell" and "Will & Grace." Sadly, it took the death of Gary Beach (Tony Winner for ‘The Producers’) for me to learn that he was the center of a crossover. Zack appears to have negotiated a great deal on class rings for the senior class, but it turns out he has been scammed [so] he plots revenge. Sly gets a job as a used car salesman and dupes Sam into buying a piece of junk. I never saw either episode but I get the feeling that "Gem Diamond" was quite a con man. The man responsible for Gem Diamond into both shows was Brett Dewey. He co-wrote "Class Rings" with Ronald B. Solomon and as the co-creator of 'California Dreams', he wrote "Honest Sly" on his own. So Gem Diamond came so close to completing the trifecta which would qualify him for membership in the Television Crossover Hall of Fame. But now, it's not to be. With a bit o' splainin, perhaps we can make an honorary memorial tribute exception for him. Let's take a look at Gary Beach's resume at the IMDb. Ah! And there we are! Rebecca is planning a bachelor auction at the bar to raise money for Children's Hospital. Despite Rebecca's nonchalance toward his participation, Sam ends up being one of the bachelors, as is Woody (who she actually asked). Both Sam and Woody end up regretting it because of who purchases them. Why can't the Emcee be Gem Diamond? 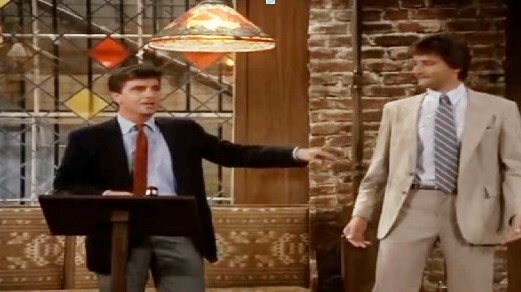 We never learned his name while he was at Cheers, and let's face it, "Gem Diamond" was more than likely an alias as well. So I feel safe in claiming that he was Gem Diamond. I wouldn't be surprised if he skimmed something off the top of the proceeds from the auction to line his own pockets. That would certainly splain away why he was seen only the West Coast afterwards and using "Gem Diamond" as an alias to cover his trail. Although it's too late to "honor" (or the nearest equivalent) Gary Beach while he was still alive, I hope this small attempt serves a memorial in Toobworld. Let's give him a hand... or three. VIDEO SUNDAY - "THE ADVENTURES OF HIRAM HOLLIDAY"
We continue our celebration of the summer time with this look at how one citizen of Toobworld went on vacation in 1956. 'The Adventures of Hiram Holliday' is an American adventure sitcom that aired on NBC from October 3, 1956 to February 27, 1957. 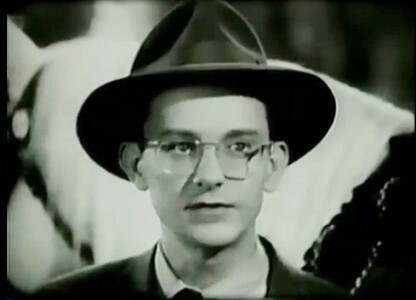 Starring Wally Cox in the title role, the series is based on the 1939 novel of the same name by Paul Gallico. The series is similar to the book, and focuses on the adventures of a newspaper proofreader who through years of secret practice has gained James Bond-like skills in many forms of physical combat, shooting, and in activities as diverse as rock climbing and scuba diving. The proofreader, Hiram Holliday (Cox), was revealed to be muscular when stripped. The starting gimmick of the series was that Holliday had inserted a comma in a news story which saved the publisher a small fortune in a trial. The grateful publisher rewarded Holliday with a trip around the world, which set the scene for him to solve crimes and thwart foreign spies in every port of call he visited. 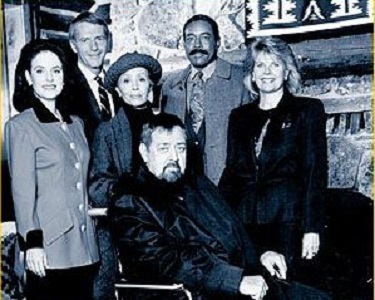 I stumbled on this during my research into Sebastian Cabot, who would have been 100 years old back on July 6. 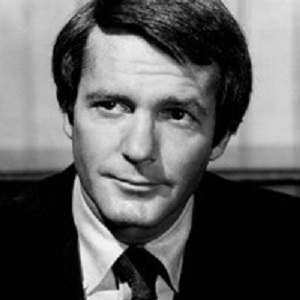 He appeared in three of the episodes, all as different characters, and two of them will be seen here today. Growing up, Wally Cox was always a favorite. The world has been a poorer place without him around. I had heard of this sitcom, but never had a chance to see any of Hiram's vacation stops. But now I have.